I’m afraid I’m going to start yet another post about what I did with fabric given to me at my “exit party” last fall. Maybe you’re getting a bit tired of this subject, but I have to say I have never before encountered such examples of the “law of unintended consequences”. It feels like I’m getting smacked in the face with them. I never expected that suggesting people bring a metre of fabric as a gift to my party would result in changing the way I dress. Who’d have thought?? But as I’ve tried to match clothing designs to the fabric, that’s what’s been happening. 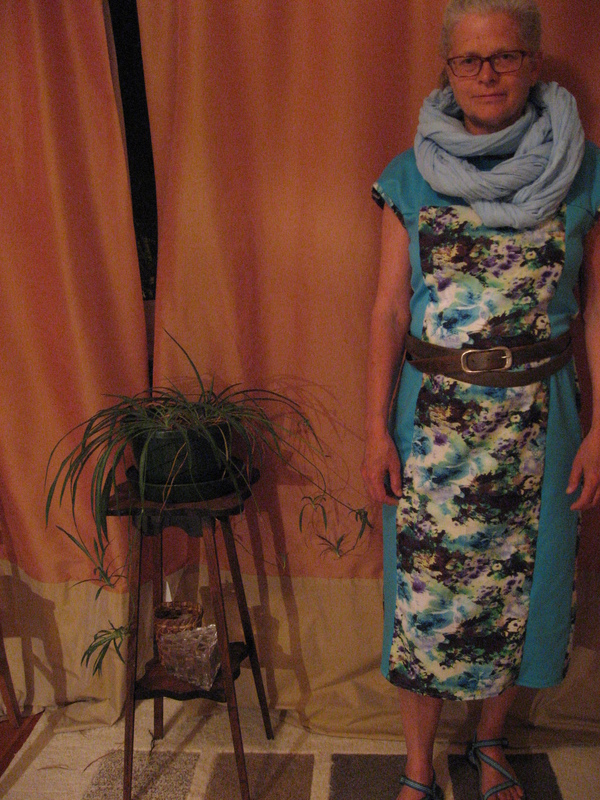 The picture on the left is from Simple Modern Sewing, which I’ve made several tops from. 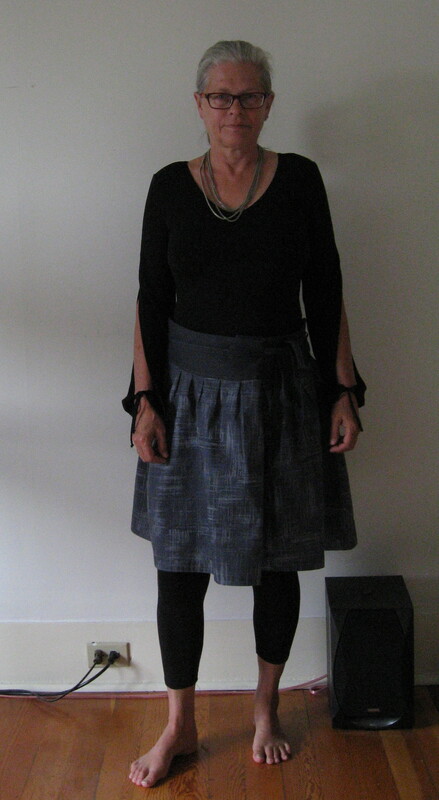 The picture on the right is my version of the wrap skirt. 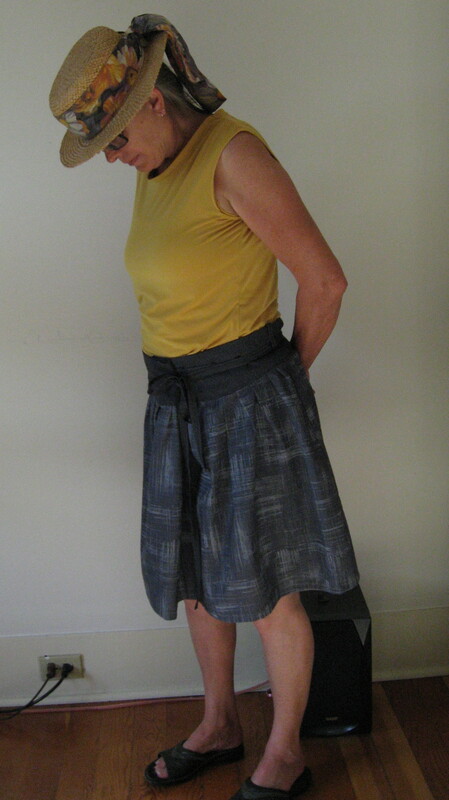 Olivia, my former colleague, supplied exactly one metre of fabric, which wasn’t quite enough for this skirt. 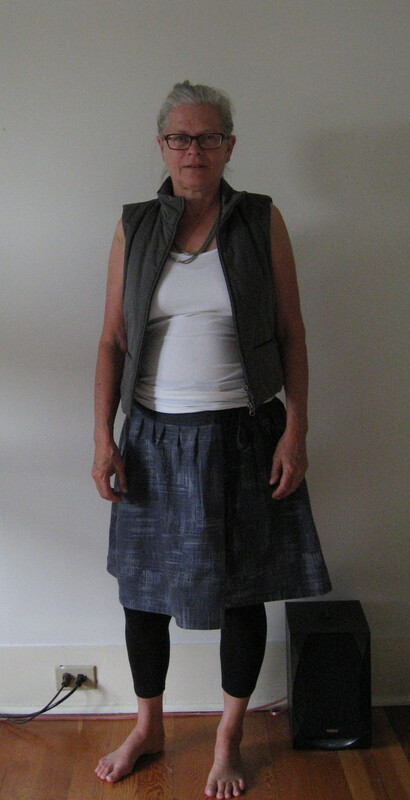 I had to shorten the skirt, because the full length of front and back panels required about four inches I didn’t have. I got some matching fabric for the yoke at the third fabric store I tried. Given that the fabric is grey with a bluish cast, it wasn’t as easy as I thought to find a match. 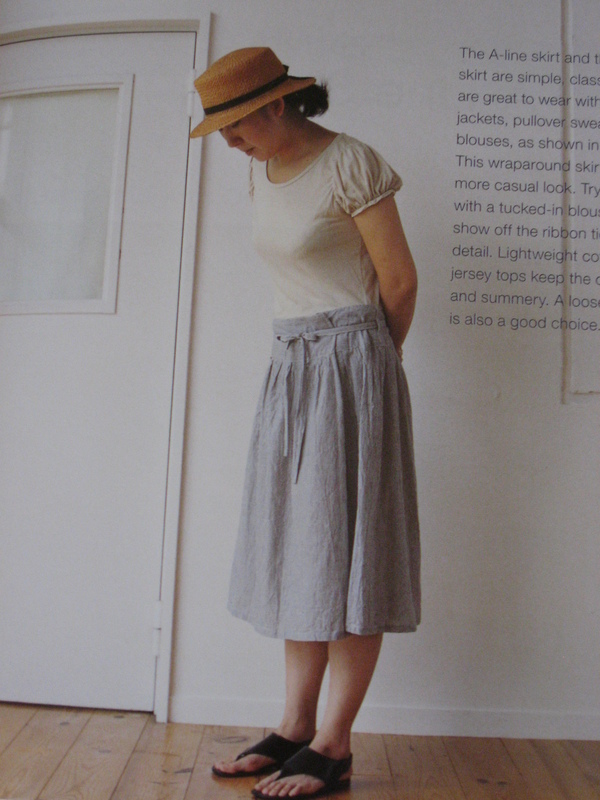 It’s an amazingly comfortable skirt. Wearing it feels like wearing nothing, which is great on the one hand, but on the other a bit disconcerting. 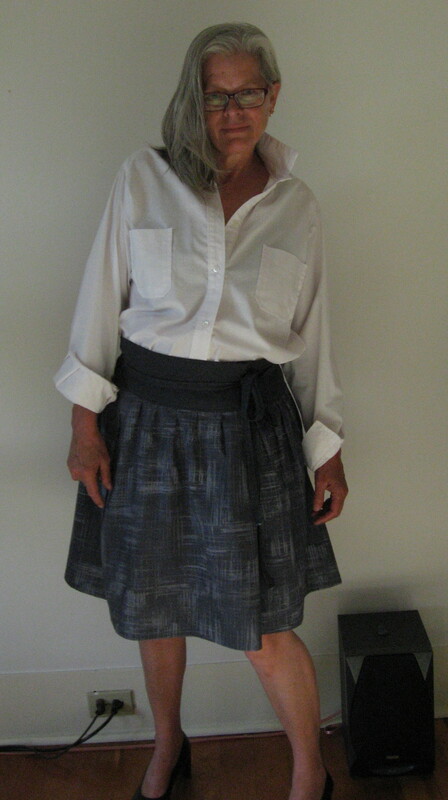 Any breeze at all will blow this skirt up around my waist, I fear, and I do live on the wet-coast rainforest, which is windy. It’s a nice design, a fake wrap that’s really a tube. There are two ties, one of them starting inside the yoke and emerging out of a little hole in the side seam, so you can tie it as tight or loose as you like. I made the medium and the only change I made was to redraw the sides of the yoke, reducing the slant. This resulted in an extra four inches at the “waist” (my actual waist is quite a few inches higher up). Now this look is totally me. I haven’t worn a skirt this short since I was about 17 (and my skirts then were possibly a full foot shorter), but this is a really comfortable, new look for me. It has occurred to me that the blue-grey fabric (which I love) is maybe too sombre for such a perky design. What do you think? It seems to me more vampish than modest? Does it have a touch of goth? Should I make more? I have a length of dark maroon and grey wool plaid fabric — would that work for a winter skirt? 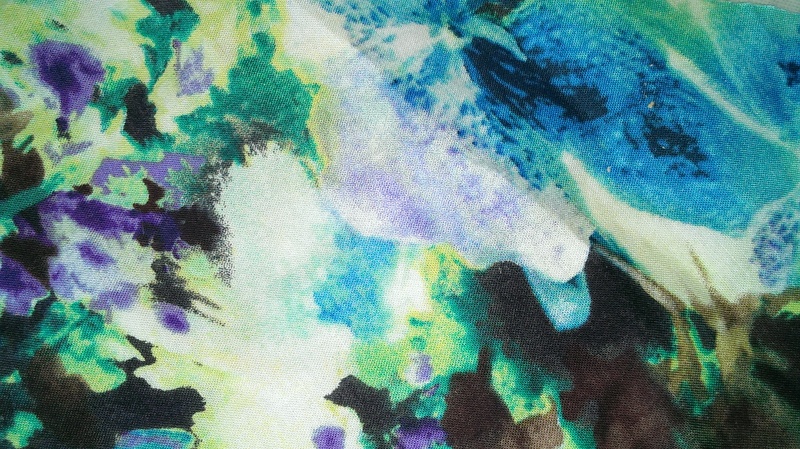 Or should I pick up some lively bright floral fabric to make another summer one? This week I set myself the challenge of making something from a piece of fabric I was given by a former colleague at my “exit party” last fall. I call the fabric “sturm und drang”. Here’s a pic: I think you can see the reason for the name. Just to make sure, I checked my closet and saw that there is, indeed, a total absence of print clothing, except for a few tone-on-tone jacquards and stripes. So, this would be a first. I like several of the many, many colours in this fabric, but from a distance it seems dominated by brown splotches that I don’t really care for. I thought about the vogue 8786 pattern that I used for “sackcloth and slink”, which allows for fabric matching because of the panels and yokes. I also considered that, given the choice between wearing a knitted top and a woven blouse, nine days out of ten I’ll choose the knit. Why not match this print with a solid knit that brings out the turquoise and produce a comfortable … uh, wonsie? I’m trying, I’m really trying to use the word “dress”, but I hate the word. It suggests everything I hate about cultural ideas of “femininity”. I know it’s just a word!! Enough, carry on. While I was giving myself challenges, I decided to underline the print fabric so that light wouldn’t shine through it. Gawd knows I don’t want to wear a slip, of all things. 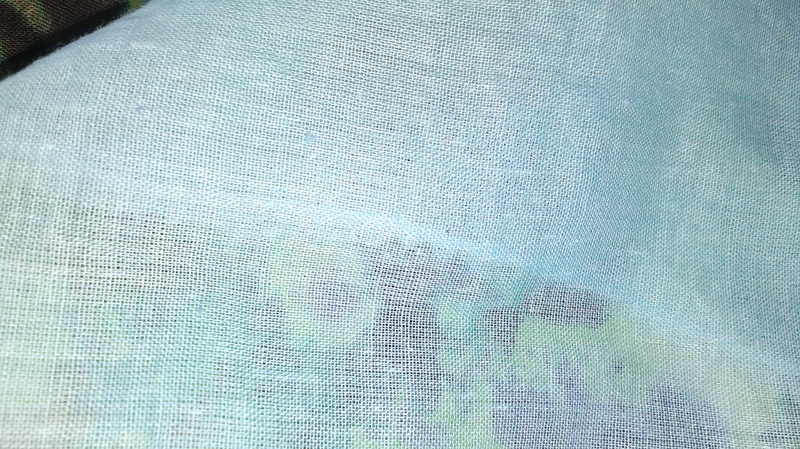 I chose a gauzy pale blue cotton from a turban I purchased last summer at a theatre sale. It turned out that underlining didn’t create any extra work to speak of. I pinned the pieces to the print fabric and used an interlock stitch to both sew them together and finish the raw edges at the same time. And I discovered that the print panels had a much nicer ‘hand’ after the underling than before. And also they were a better match in terms of body and weight to the doubleknit I purchased. I also decided to replace the back seam below the yoke with a button placket and have buttons and buttonholes running up the back. Thankfully I then had an even better idea, and made a fake button placket. That’s not terribly clear, is it? 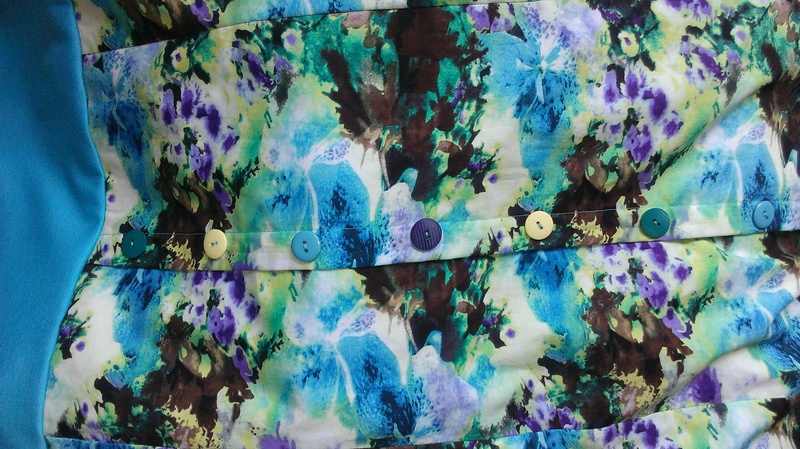 I sewed buttons through all layers without bothering with buttonholes. And while I was being innovative, I decided to use a few different colours of buttons. Okay,here’s the final product. It’s not entirely me, I think. But it’s a move in a direction I’d like to go. I tried to style it up a bit. Good use of a prop, eh? 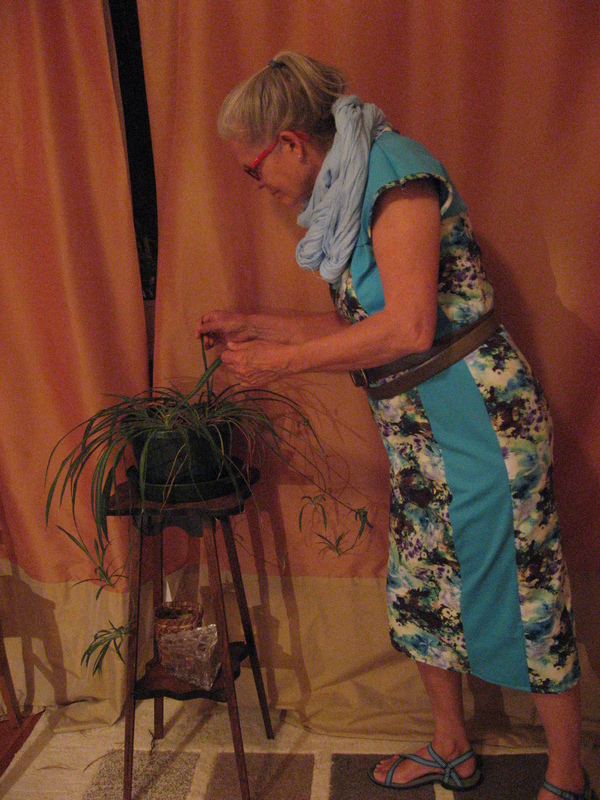 Pretending to reach up to the curtain rod, okay?? I like the back — possibly more than the front. The good news is that I’m wearing this, uh, wonsie, as I’m putting together this post. It’s comfortable. And not too fancy to be at-home wear.